Welcome to our company’s official webpage! If you have been looking for services that cover your needs of a junk removal in Hounslow, you have definitely reached the right place. We are the leading contractor in this business in the borough, and we would be more than happy to provide you with adequate assistance on competitive prices that would definitely fit your budget perfectly. We have been operating in the area of garbage removal for several years now. We have been at the service of many local residents, as well as businesses. We are very proud of the fact that all our clients have been highly satisfied by the quality of the job we have done. Our waste collection specialists are trained and fully licensed for the job. No matter whether you need someone for regular junk removals in Hounslow or you have been looking for a contractor to take up a one-off project of a larger scale – like related to a Spring or end of tenancy cleaning, or to collect construction debris after a repair of your property, we are definitely the right people for you. Give us a call and our polite and very well informed customer support team will give you all the information you need concerning our services and methods, as well as the full price for completing the job. The free quote you are going to receive will show precisely how much you will be required to pay at the end of your rubbish removal – there would be no hidden taxes or additional charges at the end – the price you are told will be the price you are going to pay, and we guarantee that you will not be able to find a better deal anywhere in Hounslow. Do not hesitate to get in touch with us and book your waste collection or house clearance with us. We are available at any time of the day and night and operate on a flexible schedule fully considered with your preferences. After builders rubbish, post renovation leftovers, discarded construction supplies etc. are all common issues after every home remodelling project. Getting rid of after builders waste is specific and laborious process which we can handle for you with professional pace, precision and efficiency. Our specialised after builders junk removals are affordable and cover the removal and disposal of basically everything apart from asbestos/asbestos containing materials. We will have your property cleared of all post renovation junk and construction leftovers without risk of damage or any delays. The service is moderately priced and won’t be a strain on your household budget. Bookings are made for all days of the week. When we say that we are the best company in the field covering the area, we truly mean it. Your comfort and satisfaction are the most important things for us, so do not hesitate to get in touch either via phone or e-mail for booking and a free no obligation quote. We operate in the borough of Hounslow, which occupies some of the westernmost territories of the London metropolitan area. The London Heathrow is located on the territory of Hounslow, as well as many bus and railway stations that make commuting to the center of the city a far easier task than it might look like. Hounslow also has a very well developed local economy, with the headquarters of many large companies and corporations based here. The Air-France KLM has offices here, and so do The GlaxoSmithKline, the British Sky Broadcasting corporation and DHL Air UK. As it is easily deduced, the Heathrow plays an important role in the economic life in the borough. The London Borough of Hounslow originates from a thirteenth century town of the same name. The borough’s name comes from Old English. Hounslow has a detailed record in the Doomsday Book of ten eighty six. 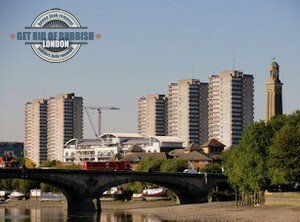 The borough was formed and added to Greater London in nineteen sixty five. Hounslow grew and expanded rapidly during the second half of the twentieth century. As the leading junk removal in Hounslow company we are available for domestic and commercial waste clearance jobs of various scope and nature. We are certified, equipped and skilled enough to carry out any line of work for you. The junk collection is going to be completed on a tight schedule considered according to your needs and preferences. We will handle the job with professionalism and care and we will not let your down. Quite often people contact us for house clearance in Hounslow. The best time for a domestic clearance is during your Spring cleaning. We will come collect all unnecessary junk, old appliances and broken down furniture as well as any other junk. We will collect the waste and then properly dispose of it in an eco-friendly fashion. You will not have to even lift a finger in order to make that happen. On top of everything else, we are the most trusted commercial clearance company in TW3 and TW4. We are licensed to work on construction sites, offices and other commercial premises. Offering a very flexible schedule with large availability as well as very competitive prices make us an attractive option for every business looking for reliable and affordable junk removals in Hounslow services. Our eco-friendly junk clearance services are available throughout the territory of Hounslow. The area is well known as one of the best residential districts of present day Greater London. Over the centuries it has been home to some really notable people, including but not limited to Actor Cyril Cusack, Arnold Paliulis, game developer and current owner of Rockstar Games, Olympic rowing silver medalist and coach of Imperial College London rowing team Bill Mason and others.